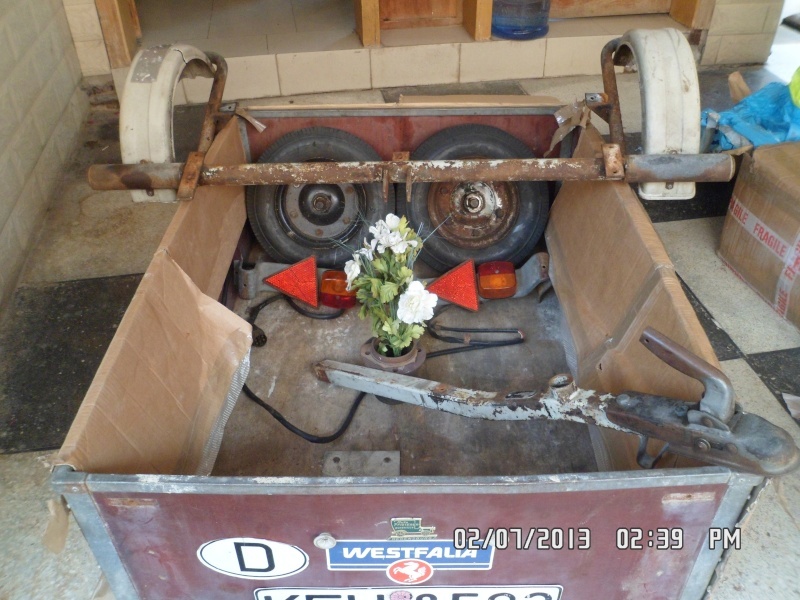 This is May 10th, 1976 Westfalia 'Essen' Trailer which needs resto but is mostly complete. 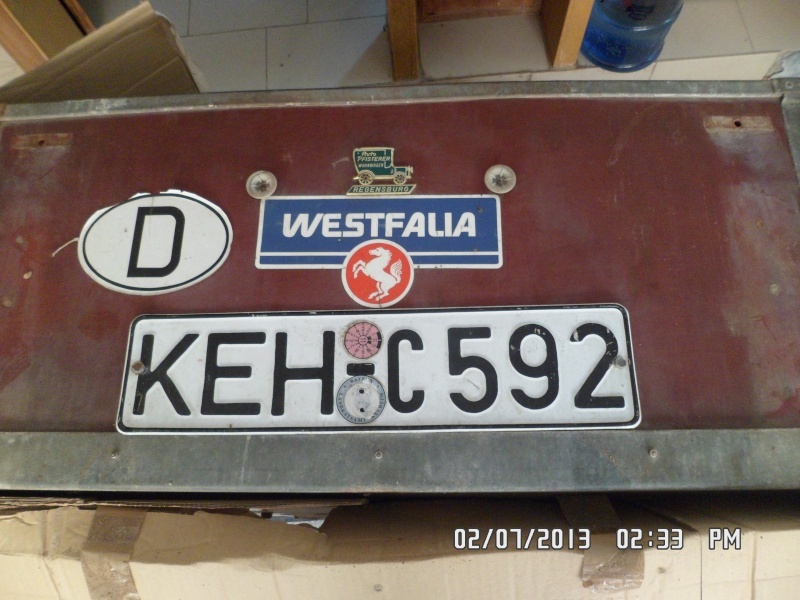 Missing tonneau (canvas cover) and the sparewheel otherwise complete. Edit: I asked my friends what could be a nick for the trailer and there were a few that were proposed and of them, W.E.T. [WET - Short for Westfaila Essen Trailer] looked catchy as proposed by my Ex-Boss Mr. Ansaar Ahmed Qureshi. 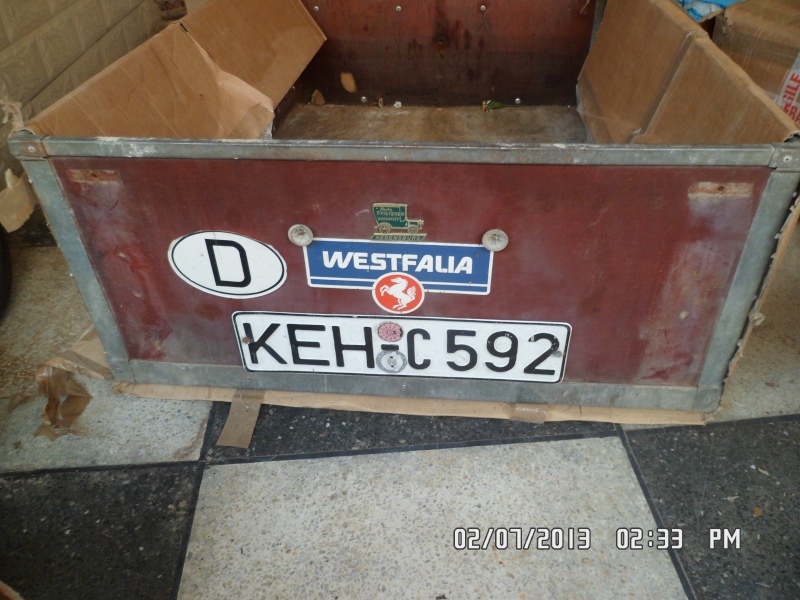 So here, I am naming this Westfalia Essen Trailer, W.E.T. 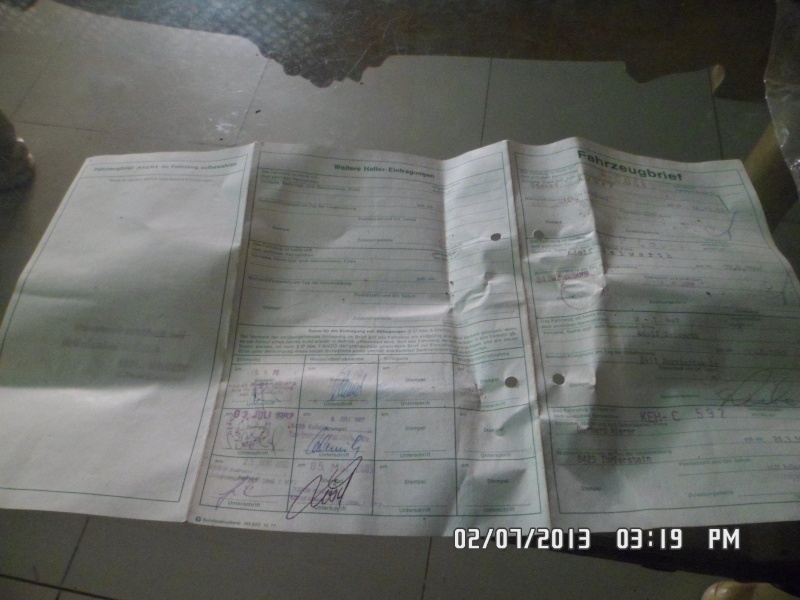 Here is the paperwork that came with W.E.T; Four previous owners, the latest owner before me was Gerhard. It was bought from a Slovakian VW enthuasit in Germnay so had to be collected. Its loaded on the roof rack in the above pic, the one that you can see towards the back of the van's roof rack. Again, loaded on the roof rack in the below pic, the one that you can see towards the back of the van's roof rack. W.E.T. disassembled and on a pallet, ready to head to its new home! With Westfalia Essen on its way, scored this a minute back on Facebook. WET came without canvas, so had to find one for it. Found this one for sale on eBay and won it. Eventually W.E.T bought months ago has finally arrived here in Pakistan today. WET is also Pakistan's first ever Westfalia Trailer of any model. Thanks to Mark Goldsmith/UK for this gem that was brought straight from Deutschland! Detailed pictures coming soon and so is the rebuild, stay tuned. Probably the most difficult part to find to complete the Westfalia Essen Trailer restoration is the spare wheel mounting bracket, if its missing. You can probably judge by the price of the repro bracket that how difficult this part is to find. I have written to Jason about the bracket but unfortunately, either he hasn't checked mail or he has given up the idea of putting a batch of the same into reproduction for now. So it leaves me no choice but to replicate it myself in my own workshop here. I will be getting onto this job in this week. Stay tuned for updates on local replication of this spare wheel mounting bracket. Finally the repro bracket too. Hey nice to find another essen owner, I am Dave and a brit who lives in Germany, any idea where I can get a canvas for my trailer, no luck in Germany. Do you know Mark/John Goldsmith in Ivychurch? I think Mark can help you with finding one. He too have moved to Germany recently. Will PM you his contact details right away. Lets see your Essen...what year is it? Do you have a pic or two to share? Cheers mate. Yeah I have some pics, I will try to upload them for you. I am stripping my Essen tomorrow and sending it to the blasters / coaters. Will be putting in new wood and would be restoring it in the coming month. Then stay tuned on here, because tomorrow I am stripping mine to send it to coaters. Cool I think the pivot arms have just 2 plastic bushes each side and that is it. Yep that is pretty much it and then there are end caps to finish these off. 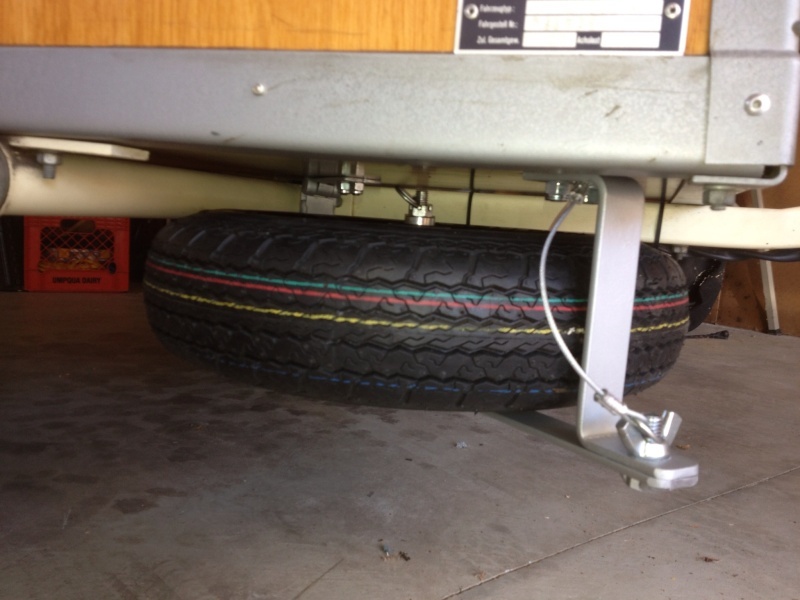 Are there any washers on the inside of the wheel between the frame where the bolt goes through to hold the wheel to the trailer? Like spacers? Or does the wheel bolt to the frames? Before I went away, the trailer was disassembled with wood removed and all and was sent to coaters. New parts need to be ordered one of these days, along with new wood to put things together once the coater returns the bits. I have some pics taken away from the time it was all disassembled but somehow I cant find my cam memory :(Will post pics as soon as things resolve with the cam memory. Thanks to Dave on helping answer some questions regarding disassembly of the glide bearings. Also was done a batch of Essen Sparewheel brackets at the workshop, while I was away.